Our vision inspires us to think differently about wealth—to re-envision prosperity as something we can only achieve if we’re surrounded by and connected to a vibrant and diverse community. Our values-based banking model is grounded in the local economy because we believe you truly prosper when you’re connected to a healthy community. There is currently one art call open for visual artists and artist teams living or working in the Vancity service area. This art call aims to engage the local art community in representing Vancity’s values and the community-focused aspects of Vancity’s branch experience. 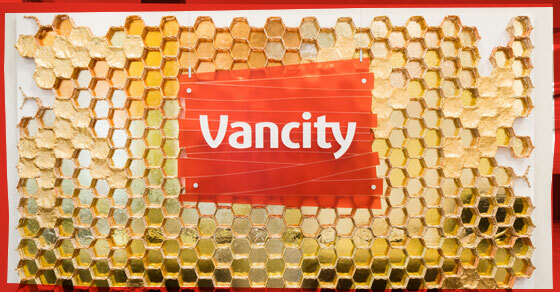 Since 2012, Vancity has launched twenty-eight public art calls for art commissions in conjunction with branch remodel, relocation and renovation projects. Please see information below on the art calls that are now accepting applications. Vancity is now accepting applications of expressions of interest from artists or artist teams who live or work in Metro Vancouver, Squamish Valley and the Fraser Valley for this branch. We encourage artists and artist teams to review the art call requirements and then visit calltoartists.ca to register and apply online. The North Road community branch art call will be open for submissions until noon (12:00 pm) on Friday, April 5, 2019. Artist Blake Williams’ commission for the Brentwood community branch entwines layers of imagery and text exploring metaphors for home and community. His process engages individual stories that speak to Brentwood’s local history and present transition. The artwork will comprise sustainable materials including recycled glass off cuts, salvaged items from local businesses and unused materials otherwise bound for the landfill. Artist Sally Vanin intertwines and layers iconic imagery, community activities, maps and stories within her work. In her commission, Sally examines multiple threads of local society, residents and history to share essential ideas and beliefs that help shape the unique identity of the Main Street (Little Mountain/Riley Park) community. Artist Bev Ellis creates textural art installations with ceramic and other natural media to convey stories about our shared emotional experiences. For the Hastings community branch commission, Bev will explore the neighbourhood's vitality and growth through imagery and metaphor, recognizing the people of the community and highlighting how Vancity strives to create a supportive space for diversity and members' well-being that is deeply rooted in the community. Pilar Mehlis and Sonya Iwasiuk’s artist team, Heads and Tales create collaborative installations reflecting on communities; their history, ideals, aspirations and hopes. Their multimedia commission for the New Westminster community branch will incorporate paper, acrylic media, wood, lighting and upcycled materials to share a transformative story crossing timelines and geography, acknowledging New Westminster’s Indigenous peoples, landmarks, diversity and growth. Artist and photographer, Sharon Tenenbaum creates multimedia artworks using recycled materials and innovative imagery to portray nature, urban landmarks and community leisure. Sharon’s commission for the North Vancouver community branch will playfully explore life and activities amongst the North Shore mountains. Artist team Concealed Studio creates artwork that speak to the layers and diversity that form a strong Fraser Street community. Using light, print design and geometric shapes, Concealed Studio’s work will also pay homage to the neighbourhood theatre that once stood in the building where the Fraser Street community branch now stands.